Engine Swap of the Day: V8 Manta! 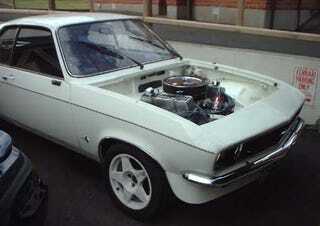 How about this right-hand-drive, Rover-powered early Opel Manta? Not only does the body boast the best of Der General's styling, the interior has been upgraded with the addition of tasteful red-and-black upholstery. And since the Rover SD1 engine is technically a GM product, there's no cross-manufacturer blasphemy involved! Mein Gott! Manta, Der Film!